Life has finally settled down again. It has been a very strange two years – ok, two and a half. 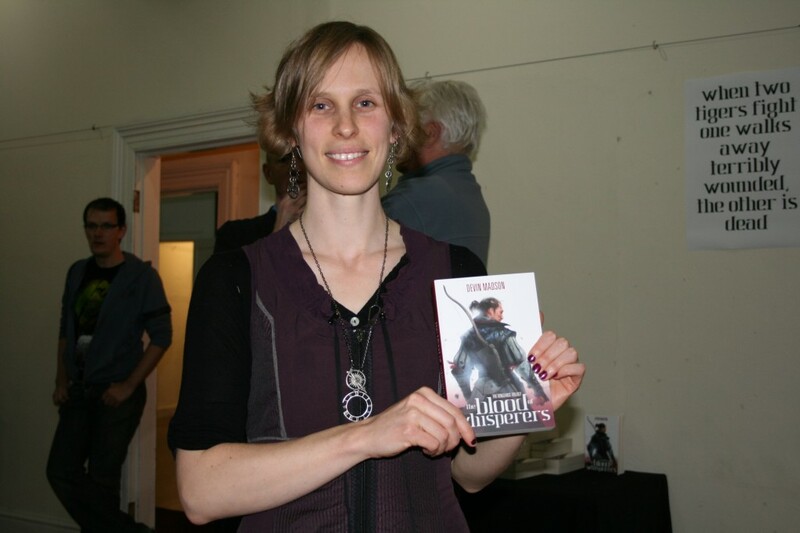 It has been two and a half years since The Blood of Whisperers was released, and in that time I have moved country twice, moved house an additional three times, got a new partner, bought a house with him, and had a baby, all the while being mum, taxi and cook to my two girls. This is Dominic. He’s the new addition to the family. Like my other two children, he looks like his dad. I’m not sure why it is, but even with a new partner I STILL can’t get a look in genetically. But regardless there will be NO MORE BABIES. We are done. Population maintenance has taken place – one child each to replace me, my partner and my ex-husband. This is the view from the deck. Twenty acres of untouched bushland, neighbours on one side – too far away to hear or even remember they are there – and state forest on the other side. It suits my introverted soul perfectly. And now that life has settled down everything is coming together. There is so much excitement for this year I can’t wait to get it all going and share it with you. So today is my birthday. Normally I’m not one to even bother acknowledging this, but for some reason this year feels a little more special. I’m 29. Not quite the big 30, but certainly the last year I can claim to be in my twenties. The last year to get things in order before another stage of life. Not a big deal in the grand scheme of things, and yet last night I found myself stressing. I’m only 29 and already struggling to feel as though I have achieved anything – how am I going to feel at 30. At 40. At 50? Yes I have two beautiful children and a third on the way. Yes I have sorted my life out after a difficult move to another country and the subsequent divorce. These are big things, but I find I don’t define myself by my ‘real’ life. The fact that I can cook awesome meals, that I educate my children, that I sing to them every night, that I am the glue in this new family of mine means only so much when your dreams have stagnated. I released The Blood of Whisperers two years ago this month. I had a completely different life then with a different partner and a different future, but I believed I had set myself on a path that all I needed to do was keep walking. The Gods of Vice came later the same year and the third book seemed poised to follow soon after, until we moved to Canada and my whole life fell apart. I have rebuilt it now, but what I grudge most is the time I lost, not the pain. In two years I ought to have done so much. Written so much. Grown my career. Connected with many more readers and fans of the genre I love. Spread my wings and tested the waters and worked toward being the author I want to be. Instead I have to start over. So at 29, I find myself staring down my own expectations and starting the plan all over again. One year to get myself back on track. One year in which to release The Grave at Storm’s End, to write, to engage, to throw everything I have at this career of mine in the hope that the big 30 will not send me into a real panic. So for all of those friends and fans who have stuck with me through this difficult time I cannot thank you enough. You keep me believing in myself and allow the dream to live on. And an extra special thank you to the two men who have been such anchors in my life. My ex-husband Devin (yes I stole his name) for making everything possible, and my current partner Chris (I didn’t steal his name) for encouraging me and helping me to work through the dark times. Loves to you all on this day. As Google was kind enough to surprise me with a spread of cakes, I leave it to their eloquent imagery to see the post out.